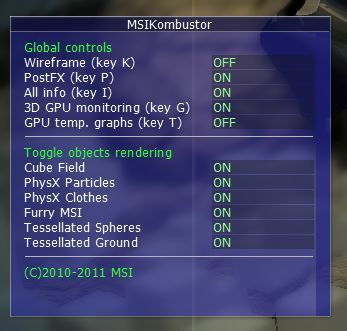 The new version of MSI Kombustor is available. 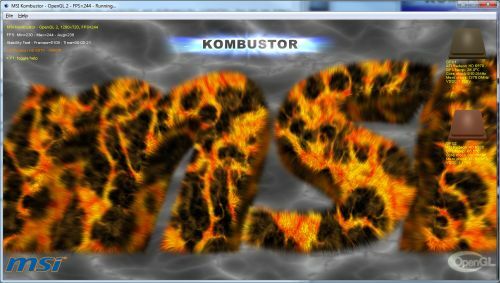 Kombustor is MSI’s VGA burn-in test and benchmark utility included in Afterburner package. People that asked me to make an unique benchmark gathering FurMark, FluidMark and TessMark will be happy! 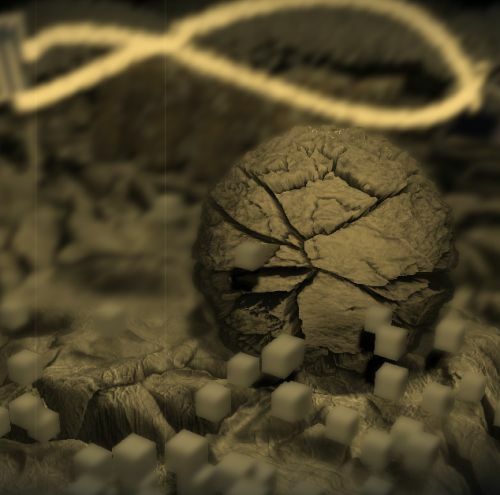 Like 3DMark11, there are ready-to-use presets: Extreme (1910×1080) and Normal (1280×720). You can can submit your score online in order to compare and compete with other users. Online scores are available here: MSI Kombustor Scores. 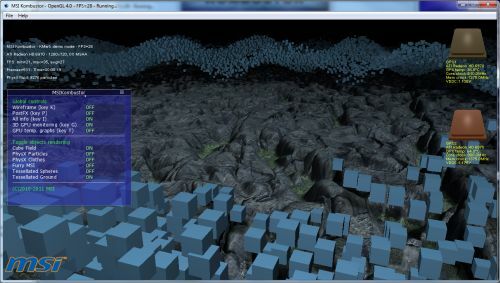 There are actually four benchmark modes: Extreme or Normal and with GPU PhysX or CPU PhysX. 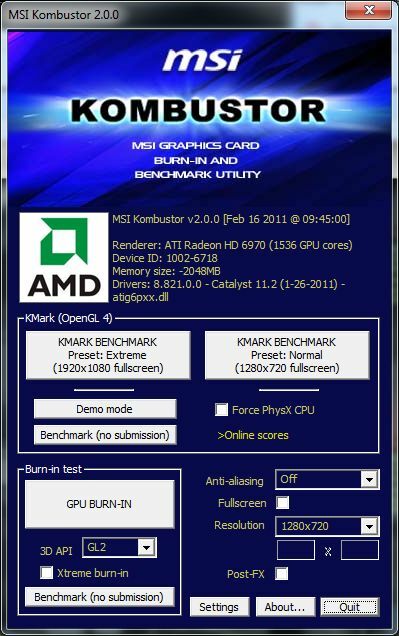 The original burn-in module based on FurMark engine is still there and has been updated with a increased graphic workload. You can now change the fur color and the background image thanks to the new Settings box. If they could only add artifact detection this could be the perfect benchmark. Oh.. and again: is it so difficult to enable SLI from software? “Another_Useless_Test” it’s me just to prove ahow much useless it is. I really like the new version… but I would like to see the ability to use multiple cards in Windowed Mode. I was able to get SLI working in Fullscreen by renaming the executable to Heaven. Hii I like the new Kombustor, but i have one question how you activate the kombustor to work whit 2 gpus , i put to run the kombustor but just 1 gpu is working , i have to activate somewhere ?? wow! finally the unified benchmark ive been looking out for!!.. @zibri..thats an obvious hack or submission error there..no way them points add up..
seems this is weighted weird on the SPS side.. 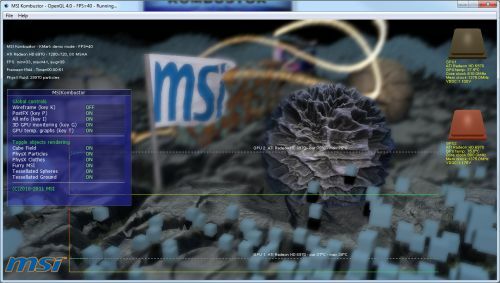 It doesn´t detect multi-gpu, i´ve got gtx480 SLI and only run with one. Renaming to heaven.exe only works part time. Last 2 benchmarks still not fully using SLI (3x GTx480 here)…but still better than nothing.